As your flowers begin to fade and you harvest your vegetables, it’s time to think about collecting seed to save for next year. Many plants are quick and easy to grow from saved seed and you’ll be able to spend the money on something else. Seed is cheap, certainly when compared to buying plug plants. You can have a lot of plants for a relatively modest outlay and you may even have some to swap with friends for other plants that they’ve grown. You get a variation of plants, with some taller / shorter / different colour / bigger flowers - this doesn’t suit every situation, but does give a bit of variety in an informal area. You do get a lot of plants! It’s very hard to gauge how many seeds you need to sow and you often have far too many seedlings. You have to have time to deal with indoor seedlings as they grow; pricking them out before they become drawn and leggy. The genetic variation mentioned above can bring a mixture of sizes and shapes that you’d rather avoid. Seed can be tricky to store properly and doesn’t always germinate as well or as quickly as you need it to. Seeds can suffer from many different forms of dormancy, which need breaking in order for germination to begin (we’ll look at dormancy in the coming weeks). You can sow seed straight into into the ground, if you know where you want to grow the new plants, or into pots to overwinter. This is what would happen if the seed head fell to the floor naturally. Bear in mind that not all of it is capable of surviving the winter if it begins to grow too early and you may suffer losses if the seedlings get frosted. However, some seed (especially tree and shrub) has to have the cold of the winter months in order to germinate. This chilling (called “stratification”) helps break down chemicals within the seed itself that prevent germination until the temperatures are warm enough for the seedling to grow. You need the seeds to be fully ready before you prepare them for storage, so either leave them on the plant or cut the seed heads as they begin to turn brown and lay them on newspaper or paper towel in a seed tray. Keep this somewhere dry and airy to let the seed head dry naturally. Some pods and capsules, like perennial sweet peas, release their seeds explosively to fling them away from the parent plant into new ground, so these are best kept in paper bags. This contains their precious cargo and saves you having to scrabble around looking for it. You can save seed from peas, beans and tomatoes very easily, although the seedlings may vary considerably from the parent plant if you have grown F1 hybrids (see below). Once you have all the seed, clean it to remove any dirt or bits of plant then put it into an envelope, labelled with the plant name and date of collection (month & year) so you know exactly how old it is. Put the envelopes into an airtight container and store it somewhere dark and frost free. 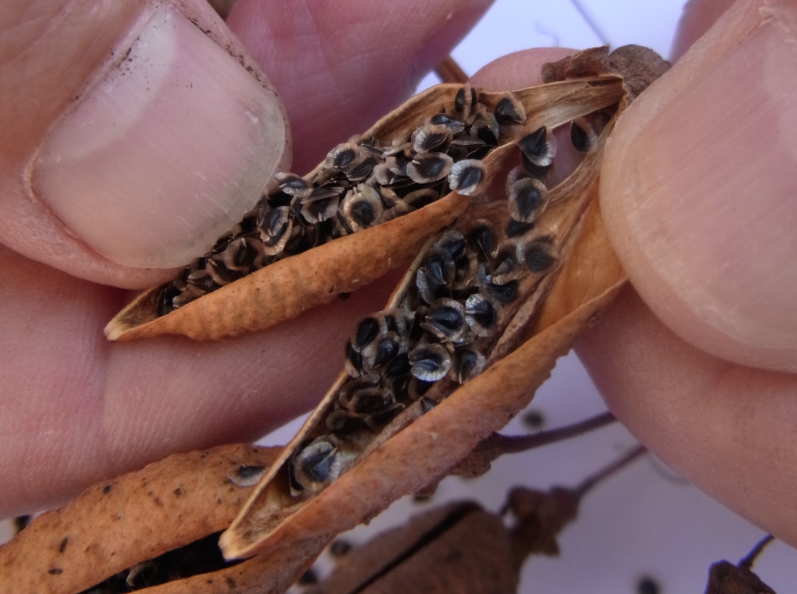 Kept like this, the seed will remain viable for some time, although this varies from one species to another and is dependent on the condition of the seed when it was stored. Healthy seed in correct conditions should be good for at least 12 months before it begins to deteriorate. After this, the percentage of seeds that germinate will begin to fall. Packets of seed labelled F1 are more expensive than the others because this seed will produce better plants. This is a “first generation” (F1) cross between two parent plants that have been found to produce consistent plants with bigger flowers / more scent / better sized tomatoes or vegetables and so on, an ability referred to by the breeders as “hybrid vigour”. Saving seed from these plants will not reproduce those parents and the next generation (referred to as F2) will be completely mixed in terms of size, shape, colour or scent. This is due to cross pollination of the F1s bringing out characteristics from past generations. We’re often asked whether F1 seed is worth the cost and the answer is yes, if you want to know you’re going to get bigger and better plants. If you aren’t worried about size, colour or an even crop, then non-F1 seed is fine.